This is the age of including your pet in everything from birthday parties to weddings, yes weddings! 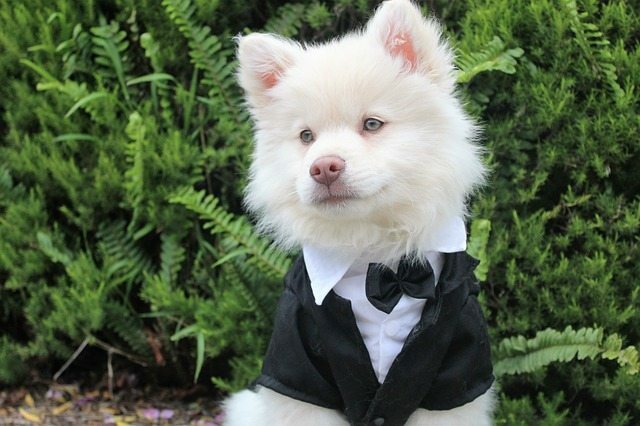 Do you want your dog the wedding, but it’s not an option? We can give you 10 tips to include your furry fido friend, even if he or she cannot be there! Pictures: Usually, the bride and groom have imagery of themselves around the wedding venue. Include your fido in the collage! Do you have any family photos that include the dog, if so place them for all wedding guests to see. If you’re really wanting your fido in the wedding, dress him or her up, snap a picture and feature it where your wedding guests walk into the venue! Groom’s Cake: The groom can pick any cake that he wants, perhaps picking cake that looks exactly like Brutus would be a perfect idea? Bakeries are more than happy to create a confectionary wonder of your furry friend! Cake Topper: Did you know that you can have your cake topper customized? Gone are the days of the bride and groom on top of the wedding cake, it’s now bride, groom, and pet! Choose a family photo that you both love and it can become part of your cake! Wedding Invites: Keep fido in mind when you are sending out wedding invitations. Most of the time, it’s the couple that is the center of attention in the photo included with the wedding invitation, but if you can’t have your dog at the wedding, include it in the wedding invite! It’s probably safe to say that the dog will steal the show on this part of the wedding planning process. Engagement Photos: Be sure to include your dog in the engagement shoot! Most photographers are more than happy to do photos to include your fur baby. Think about how you can use the dog as a prop. Perhaps your dog can hold the sign announcing your engagement, “will you marry me”, etc. Get creative and give your dog all of the credit! Dog Friendly Cake: Nothing would be cuter than letting your dog join you at the reception table for a slice of cake. It’s a must that your fido friend take part in the cake eating process! At home, make a dog friendly cake for your furry companion to enjoy. Decorate it, have you and your future spouse cut the slice together, then serve it to your beloved pet. Go all out and make a towering dog friendly cake if you really want your dog to experience the reception. Wedding Favors: Place a few doggie bones in a doggie bag for your wedding guests to take home to their fido friends! Your dog would be most pleased if it knew that it provided such gourmet treats to its fellow canine companions! Name Cards: At each table at your reception, create a dog themed name card! We tend to find that bone shaped name cards are the best choice. Place the name of the each person that belongs at that table on the bone, you now have made the best name cards ever! Thank You Notes: Don’t forget to write thank you notes for all of those awesome gifts you received! When you write your thank you notes, include your dog’s stamp of its paw; it’s not only adorable but ever so clever! If your dog will not do the stamp, simply sign its name on the card. Guest Book: On the front cover, have your dog’s picture with their name and a cute saying from the dog. Perhaps having a dog bone shaped pen would be the icing on the cake (see what we did there?) Your dog will be most pleased with all of the comments about him or her in the guest book! If you are looking for a perfect venue, choose Ocean Isle Beach! Our North Carolina beach wedding planner will help you plan the wedding you want! Contact us at 910-575-5988 or visit our website, today!